From her Kernersville studio in North Carolina, Maggie Weldon preserves priceless memories with delicate imprints of antique lace. 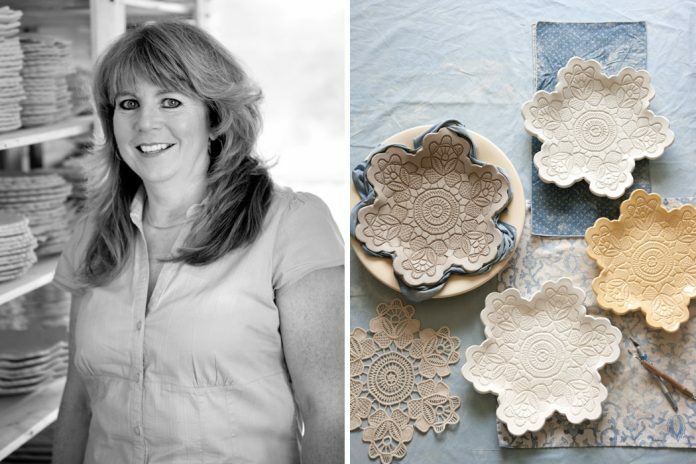 A discovery she made along with her own storied pathway of chance and determination, the artist’s meaningful Lace Pottery seems a tailor-made expression of her soul. From her workroom, Maggie Weldon fashions pottery from large slabs of clay and remnants of lace. 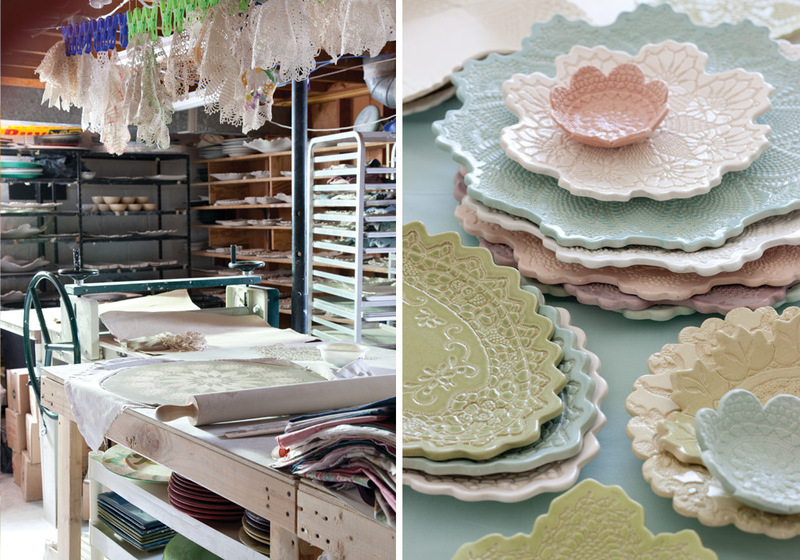 Stacks of plates are fired, glazed, and fired again to create pastel-colored pieces to be used as serving dishes and house eyeglasses and soap. To help her company prosper, Maggie draws support from Count Me In, and organization that champions women entrepreneurs seeking to expand their businesses. 1. 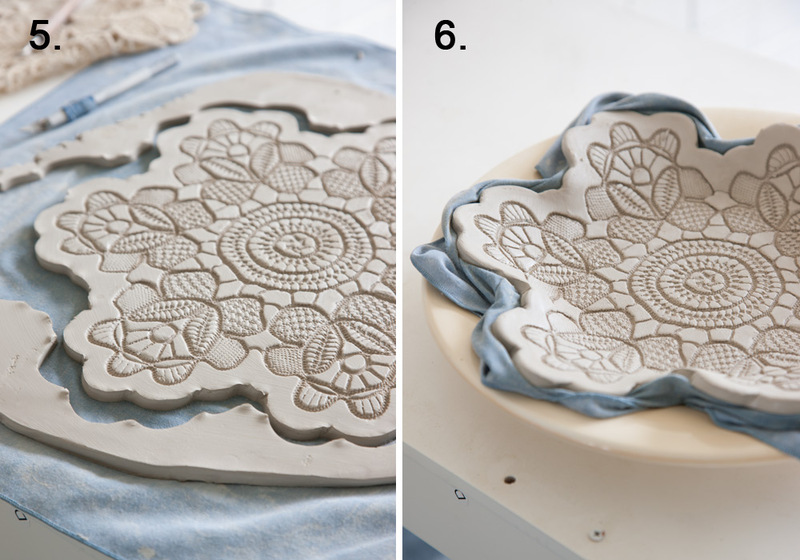 Using a rolling pin, roll out a slab of porcelain clay 1/4 inch thick, making sure the slab is about 4 inches larger than the size of the doily to be used. Place the slab on a piece of cotton fabric. 2. 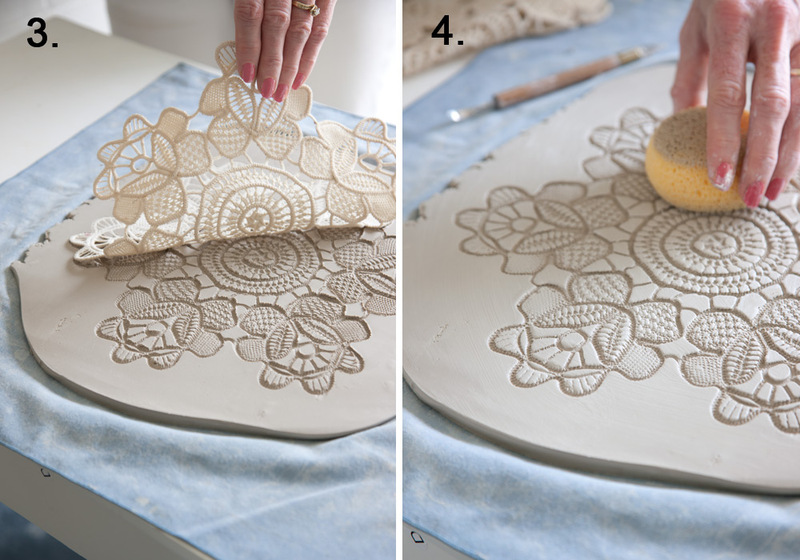 Using a rolling pin, press the doily into the clay to make an impression. 3. Gently and slowly, peel back the doily. 4. 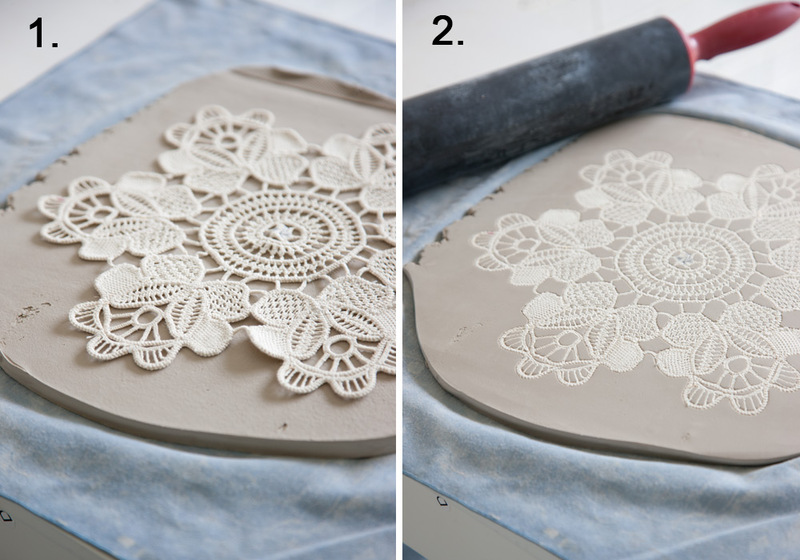 Using a wet sponge, clean and smooth the lace impression, making sure to wipe away any loose particles of clay. 5. Using a pottery knife, trim around the outside edges of the doily design, smoothing any rough edges with your fingers or a wet sponge. 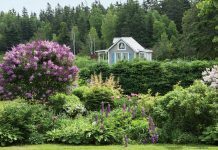 For more information on Maggie Weldon’s designs, see “Timeless Impressions,” in the May/June 2011 issue of Victoria magazine. Achei interessante esta técnica.Gostaria muito de experimentar! Beautiful idea, but not practical for anyone who doesn’t have a kiln. Use cold porcelain clay. It doesn’t need a kiln. You can find recipe to make cold porcelain clay on pintrest or YouTube or just Google it. Hi CJ, If there is a pottery store around where you live, they often will fire it for you for a minimal fee. Or you could use air-dry clay, its cheap and has many uses! What does one do if we have no access to a kiln? I really like that idea as i love Victorian decor. THANK YOU!!!! I am glad to know that cold porcelain clay does not need to be fired! I trust I will find the porcelain clay at Hobby Lobby or at Michael’s. I agree with the other comments…..Do you have to fire the clay? Could you do this with Femo clay and just bake in the oven? Such a wonderful idea but the instructions are leaving to many questions unanswered. Maybe. Poly clay is NOT food safe, but could be used for other things. Well you could paint it or you could glaze it. Thank you for the instructions, they were complete, disappointed with peoples coments. I am going to try this, the pieces are so pretty! These look beautiful but it’s become impossible to find lace doilies anymore. They’ve been replaced by the paper variety. Thank you for showing this beautiful work. You can find lace doilies at almost any and all antique shops. The generally cost a few dollars depending on the sizes. Oh I have a few that my dear mother made, I would love to do this. I’d rather it be too hot to cook in Umbria than what it is he0Tr#823&;eoo hot to cook in New York! Off to Basta Pasta tonight with friends. If you haven’t tried it, it’s great- Asian/Italian! Try antique shops. Many have doilies for sale. Also resale and consignment shops. I had many of my family’s, sold some but still have many if you are interested in buying. Try antique stores! We were just at 3 antique stores yesterday and found thousands of doilies! Goodwill often have a variety too. Our “dollar store” has them…for a dollar! I have a lot of Lace Doilies my Aunt made in the 50’s and 60’s and they are Beautiful. I’m curious about the glossy finish on the bowls in the pictures. What did you use? I’ve used air-dry clay before, and it dries fine, but matte. I’d like to put a shine to them. 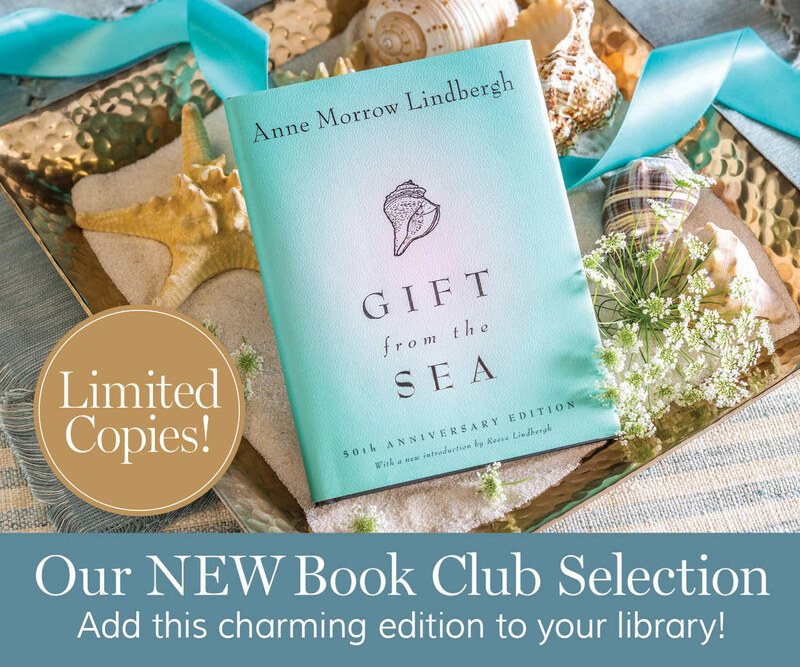 Please include the gloss info in your reply. Jeg bruger lak ovenpå malingen, det gør leret stærkt og blankt..God fornøjelse! That’s beautiful ! Wish I could do that. Sure whatever clay you use will give instructions on baking the clay if it’s possible to do so! I wonder if you can use air dry clay, paint as you wish and then maybe paint on a layer of resin? That would make it durable and have a gloss. I think they sell the liquid resin at Michael’s and other craft stores. You could use air-dry clay or you could make it with polymer clay which you can bake in your oven at home. Both clay products are available at your local hobby and craft store. Easy peasy. I don’t think the resin would work because it is self-leveling and this is a curved surface, but polymer clay artists like to use polyurethane glaze. Just be sure you’re not planning to use this project for food. Either clay can be painted with acrylic paints to get your pastel look. But beware…this craft is addicting and it will be hard to stop once you start. Creo q para la creación no hay límite se puede usar porcelana fria o pasta piedra si se usa para servir comida calientes puede ser para masas,frutas o plato de apoyo. The instructions above say for US to use “porcelain clay” as in cold porcelain. That way, yes we CAN ! Lovely idea! I have just had a go at making one. I used air drying clay, The clay I used drys white. worked a treat! How did yours turn out? What paint did you use? These are simply fabulous. I can’t wait to try. Thank you so much for the instructions and inspiration to do this. Fixing to give you a follow. 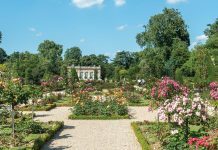 Hope you can join my blog as well. But it does say they are fired, glazed and fired a second time? ? That’s awesome, Virrginia, wow! What type of paint AND gloss do you use? And do you have any photos of your work? Thank you very much Maggie to share with us this lovely idea with doilees. After the bowl is dry, do you put some gloss in it or not? I think will be beautiful with a coat of gloss! I’ll waiting for your answer! 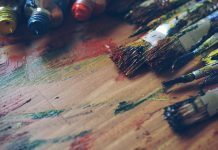 Como é que se termina a parte da pintura? Que tipo de tinta? Como le das brillo a tus trabajos al momento de finalizar y cuando ya pueden ser usados? These are lovely and I am going to give them a try. I was wondering if you paint them with acrylic paint? I am guessing the porcelain clay dries with a glossy finish. We have a shop where you can paint pottery and have it fired….I will be asking if they have acces to wet slabs!! This is an amazing idea! Thanks for this! What kind of paint would you use for food and dishwasher safe? Also, what gloss would you recommend? Thank you. Looks really lovely, I’m going to try with earthenware clay,as porcalin clay needs a high temperature,and you can have amat or gloss finish.My kiln is for earthenware and stonewear. I live in the wonderful Okavang Delta, Botswana.We had a lovely heard of Elle’s visit us last night.Blesed to have wildlife. how do you get the colored lace bowls if you do not glaze and fire? Oh I am so excited, I was fortunate to get my mother-in-laws lace doilies. I did not know what to do with them, and I did not want to just give them away, mainly because she made them. I think of all the work she put into them with much love. Thank you for sharing. Now I will share with all the grandchildren. try looking for doilies at thrift shops too! i have found a few there. what kind of paint???????? for the different kinds of clay???? cold porcelain clay? poly clay? love the look of the plates in pictures. I think you’ll find the answers to your questions in the comments. There are a lot of really good pointers thst people have been generous enough to give us. I’m completely new to this, have never even seen the clays at all, so all the helpful comments were a big plus for me that I found by simply reading, and I am gratefully appreciative of. So, wish me luck! Can’t wait to try this craft. I have done pottery but prefer hand shaping items as to using the wheel. shop if you are open to public. Thanks for sharing your gifted talent. Hi! Where can I get the magazine issue that was recommended in this article? 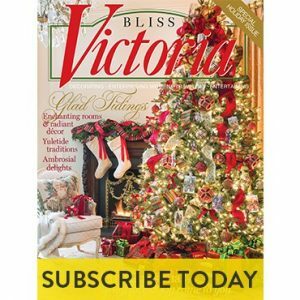 It’s “Timeless Impressions,” in the May/June 2011 issue of Victoria magazine. Thanks! Hi Cindy, thank you for your interest in Victoria. Unfortunately, the May/June issue is sold out. I am sorry for the inconvenience.